Touted as the next level of bone-breaking action flicks, Lockout is essentially John Carpenter on steroids, an unofficial Escape From New York (in space!) redux so dumbed-down and single-minded that it barely requires a plot at all. Which is good news, since it barely has one. 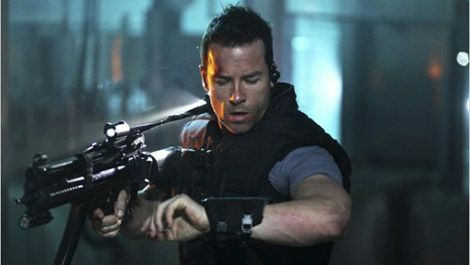 Guy Pearce is the singularly named Snow, a wisecracking, rogue ex-CIA agent (seriously) who gets railroaded on false conspiracy charges and then forced to take on an impossible mission to earn his freedom. The goal? Travel to a space prison (!) and safely pluck out the US president's daughter (Maggie Grace), a fact-finding diplomat who, naturally, finds herself in the middle of a full-scale prison riot, surrounded on all sides by crazed rapists and murderers. In space, remember. Co-written and produced by the indefatigable Luc Besson and double-team directed by first-timers James Mather and Stephen St Leger, Lockout certainly looks like a modern action film: the blue-grey monochrome sets, the CGI-boosted chase scenes, and the ADD-addled edits are all where they're supposed to be. However, this is very clearly a throwback to the cinematic wild west of the 1980s, where cartoony good guys keep up the snappy repartee even while getting smashed in the chops and no stunt is too improbable to try, not even a parachute drop from space. The only VHS-era elements missing are the scrappy low-budget grit ( Lockout ’s production cost was $20 million, which still buys a lot of digital gloss) and the R-rated cheap thrills of popped tops and flowing blood. And therein lies the problem. Lockout is like a rich kid pretending to slum it in the servant's rags, a moneyed piffle undeserving of its hype. Ultimately, it’s a second-tier weekend video rental, the bottom of a triple-bill that might also feature, say, Death Race and Die Hard 2 . You know, the one you fall asleep to in a beer and popcorn coma.